One of the most popular tourist destinations in the entire state of Wisconsin, Door County is one of the state's prettiest spots. This small county actually forms a kind of peninsula off the eastern coast of the state, jutting out into Lake Michigan. The county itself has a population of around 28,000 but attracts huge numbers of tourists each and every year due to its natural beauty and wide array of outdoor activities. Lakeshore Adventures offers one of the most exciting guided zip line tours in all of Wisconsin. 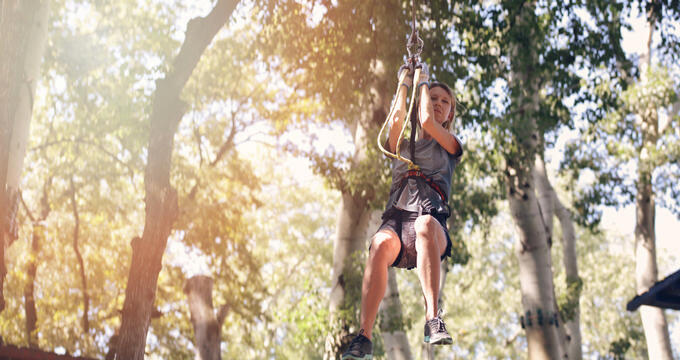 Set among the beautiful surroundings of the Ridges Sanctuary, this 20-acre adventure course features three canopy zip lines plus a final dual racing zip line, with more than 2,000 feet of cables to zip along in total. It's an exciting eco adventure for all the family, allowing participants to glide from one tree platform to the next and feel a real boost of adrenaline along the way, as well as enjoying breathtaking views and learning more about Door County in general from the friendly guides leading the way. The final 600-foot dual racing zip line even lets you race against a friend or family member to the end, and the tour includes views of all kinds of landscapes, including forests and ponds, as well as Moonlight Bay and Cana Island. The Door County Adventure Center offers all kinds of outdoor activities in the Door County area, including kayaking trips, camping programs, climbing, and of course, zip lines. So, no matter what kind of outdoor adventures and activities you want to have, this company has covered all the bases. There are multiple zip line experiences to choose from with the DC Adventure Center, including a 4-span zip line tour that is fully suitable for families and youngsters at the Egg Harbor Fun Park, along with additional zip lines at Rowleys Bay and Sturgeon Bay locations. The DC Adventure Center also runs multiple zip line combination tours involving other activities like Segway rides, kayaking, and more. If you’re looking to enjoy an awesome zip line experience in the Door County area, this is definitely a great place to start. Whether you’re an experienced zip line enthusiast or just signing up for your first ever zip line tour or experience, it’s vital to be aware of various rules and regulations. Zip lines are perfectly safe, with trained professionals standing by to teach you the basics and ensure that everyone is fully secure and at ease for the duration of their zip line experience, but rules need to exist to guarantee that no issues or problems ever arise. For example, zip line companies in Door County like the DC Adventure Center and Lakeshore Adventures Zipline will have their own specific age and weight limitations. Due to the harnesses and equipment being used, minimum and maximum weight restrictions are enforced, with guests usually needing to weigh at least 60 pounds and less than 250 pounds to ride zip lines around the US. Be sure to contact each Door County zip line in advance or check out their official websites to learn more about the specific rules and limitations before booking your trip. In addition, when the big day of your zip line tour comes along, it’s important to dress and prepare appropriately. People with long hair are encouraged to tie it up, while skirts and dresses should not be worn due to potential problems with the harnesses. Close-toed shoes are also essential as loose-fitting footwear could easily fall off while riding along the zip lines. In addition, be sure to keep all valuables and possessions safely secured in bags or simply leave them at home. Carrying a camera or phone while riding a zip line could be risky.